Asmech were successful in winning another project with a market leading dairy to improve the current packing process on site. The justification of the project was based on a reduction of over 26,000 tet movements over the course of a year, transposing into an average of 12.5% utilisation improvement. The requirements for conveying and handling was to transfer product from the current trolley packer infeed and divert them into a brand-new shrink wrap machine. After being packaged, product was orientated by 90 degrees before being elevated to high level by a spiral conveyor. Using a series of low back pressure and modular conveyor systems, wrapped packs are delivered throughout the filling hall and into the cold store where product is packed to order. To reduce stoppages to the shrink wrapper and all subsequent machines upstream, Asmech installed a series of drives and sensors on the line to allow product to be queued on the line in a build back scenario. This then meant that when a blockage downstream caused in the packing area has been cleared, the line would be primed with product. The philosophy of the line allowed product to be driven up to a motor, which would then turn off after a period of time when the sensor is covered. This would have a cascade effect on the line upstream by delivering product to the next available drive and turning off. Not only did this reduce line pressure on the system, thus alleviating brakes which would potentially damage product but also creates a utility saving by not running the motors when not required. Once product has been delivered to the cold store, a second Spiral conveyor lowerates the packs to a workable height for operators. 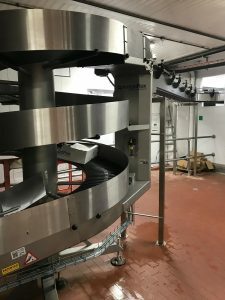 Product would then be transferred from the spiral and onto a divert conveyor where a pneumatic paddle switch product between two individual packaging conveyors. Finally, operators would remove packs from the line and stack them into the required configurations in the tets. Not only did this project prove beneficial to improve utilisation, but also reduces downtime on the line if an existing trolley packer was to go into fault. Asmech carried out the full design, manufacture and installation, along with full project management to ensure it was delivered to scope and plan, whilst liaising with the customer and other suppliers.